Thursday night yowls and big ole roars, beautiful and very bold KitKats... watching the more-than-disgusting behavior of the left-tard lunatics around the political, horror-persecution of Roger Stone... well, everything the Kougar despises, everything she despised about human behavior as she grew up in this world ... well, it is on full movie-screen display ... yes, happening right out in the proverbial open. FOR ALL TO SEE, AND EXPERIENCE. This is why many don't care of humanity is extinguished. Who wants to live with this type of insane-cruel, infantile behavior? However, the problem is: our human race has been Machiavellian manipulated for centuries to act in this *fallen* despicable way. Or, the Kougar's metaphor, it's like cutting a cow's legs off, then telling them to go graze in the pasture. The human race's legs have repeatedly been cut off, and we're sinisterly told to go out, graze, have a good life. Yeah, right. Only the Divine, the grandness of the human spirit that cannot be broken...that has saved us over and over again. We're resilient. We grow legs again, only to have them chopped off again... and thus, what you see, hear, feel, experience today IS THE RESULT of this evil brutality against WE HUMANS. Former Trump campaign adviser Roger Stone gives a statement without interruption at an Infowars exclusive press conference in Washington DC. Tune in to the LIVE Thursday, January 31 edition of War Room 3PM-6PM Central. French President Emmanuel Macron has “declared war” on the Yellow Vests, according to a figurehead in the protest movement who was badly injured by riot police last week. Jerome Rodrigues, who has become a recognizable character with over 60,000 Facebook followers, was live-streaming last weekend’s demonstrations when he was reportedly blasted in the face with a‘flashball’ – a 40mm rubber round being utilized by riot police. Rodrigues, a 40-year-old construction worker who describes himself as a “hyper pacifist,” was told by doctors he may never see from his injured eye again and could be handicapped for life. Rodrigues says he intends to return to the streets to continue demonstrating alongside thousands of French citizens who have reached their boiling point under globalist tyranny and oppressive taxation. The Yellow Vests are preparing for their 12th consecutive weekend of mass protests across the country. Infowars has been reporting from the ground in France for the Yellow Vests protests. See some of our reports here, here, and here. Dan Lyman joins Alex Jones to detail his coverage of the Yellow Vest protests in Europe where he breaks the news that French police, sometimes foreign E.U. troops, are now armed with lethal rifles and other projectiles to use on the French citizens if need be. LOVE THE LOOMER AND ALL THOSE WITH HER!!! 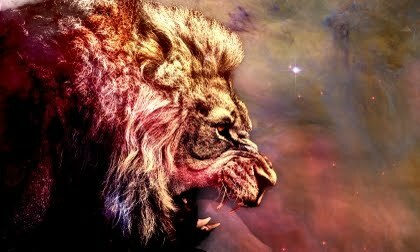 Monday nearing midnight yowls and roars, most precious-soul KitKats ... so, it's been a rough day for the Kougar...that is, in the realm of Roger Stone being stormtrooper-brutalized by Uranium One Mule Mueller, and his FBI minions ... even worse than that, and all the deepstate/darkstate horrors happening, IS THIS: make no mistake, we as these United States of America, are on the razor's edge, as far as a HOT CIVIL WAR--or a street-fought war between patriots and brainwashed lunatics ... WHY? BECAUSE PEOPLE ARE DARN FED UP with the mountains of endlessly oppressive injustices, for one -- also, there could be a rebellion against the Hildebeast system especially by those in flyover country ...TRULY, at this particular spinpoint, it is no longer about saving the cherished republic, and our constitution, IT IS NOW ABOUT SAVING OURSELVES from the darkside/deepstate forces, or ***a boot stepping on a human face forever***. It is that dire for ALL Of US, as evidenced in part by the very brave Yellow Vest Movement, who are about saving themselves and France. Note: the Kougar cannot keep up with all the vital, mind-spinning happenings in our world. It's literally an impossible task. And she is just darn tired. YELLOW VEST TYPE OF UPRISING COMING TO AMERICA??? Dan Lyman, Infowars’ European correspondent, joins Alex Jones live via Skype to give an exclusive recap of the Davos Economic Forum 2019 as well as to inform listeners of foreign troops being used to force French citizens participating in the yellow vest protests to cease and submit to the European Union. and many of them are not even from France. This type of threat is exactly why many countries are pulling out of or looking to exit the European Union. CNN scrammed when they heard Infowars was coming to the scene! Owen Shroyer is on the ground in Florida to get exclusive coverage of Roger Stone’s wrongful persecution by Mueller’s FBI and the media. 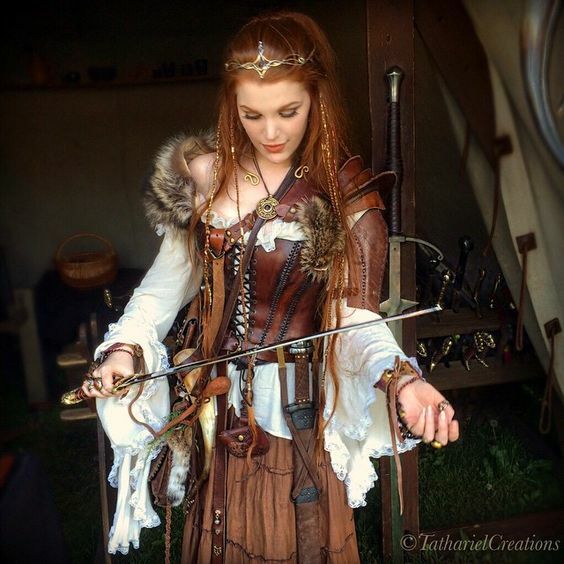 The Kougar is so upset and angry, yes, she is spitting nails like a tommy gun... Roger Stone arrested for NO CRIME WHATSOEVER!!!!!!!!!!!!! It's a dark, dark day in our beloved republic. ***FIFTEEN*** effing years ago, this Big Cat--because of her personal experience of being persecuted FOR NO CRIME WHATSOEVER, for bogus misdemeanor charges, which essentially ruined her life--SHE WARNED THIS DARK DAY WOULD COME, AS DID MANY BRAVE PEOPLE since at least 1947... that is: a NAZI-COMMIE takeover of Amerika is in the sinister works-- why? because TOO FEW AMERICANS stood up for their rights, THEIR RIGHTS FROM GOD, and let the gov brown shirts persecute anyone and everyone FOR NOTHING!!! 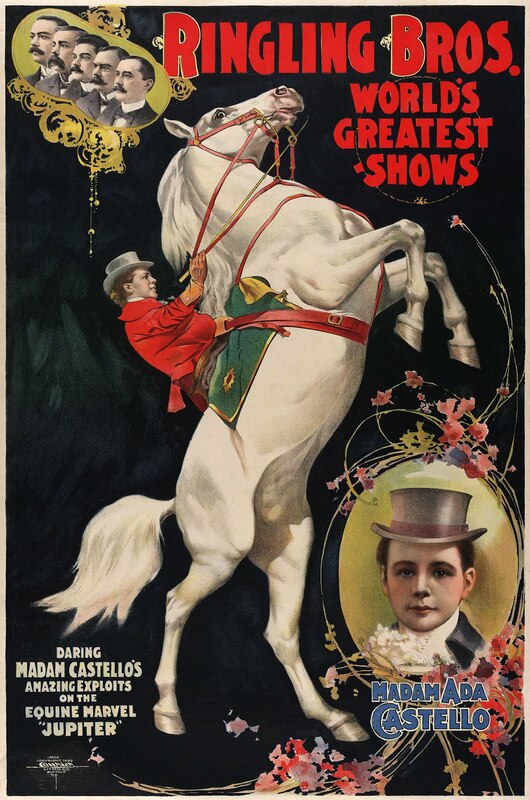 TENFOLD, WHAT IS BEING CRUELLY WRONGLY DONE TO ROGER STONE, WHAT IS BEING HORRIBLY PERPETRATED AGAINST ALL OF US... TENFOLD THIS WILL BACKFIRE ON OUR ENEMIES ... AND SO IT IS, AND SO IT SHALL EVER BE... BY THE WILL OF THE DIVINE. Ha! the ENEMY-MSM ***did not*** get their EXCLUSIVES WITH ROGER STONE... they were hopping, raging mad to say the least. The mainstream media was caught shouting at Roger Stone and drowning out his comments during his first major press conference after his arrest. Stone was met with a sea of “boos” and taunts outside of the Fort Lauderdale, Florida, courthouse immediately after exiting his exclusive interview on the Alex Jones Show Friday afternoon. Jones predicted the tactic and advised Stone the media themselves would attempt to silence him during the press event despite the fact that Stone was exercising his right to free speech just as the press does every day. Not long afterward, Stone returned to the Alex Jones Show to deliver exclusive statements away from the disruptive media. Tune in now to catch details how he’s limited to Washington DC, New York City, and South Florida. Roger Stone attempting to refute the crimes charged against him before the shouting press. Roger Stone delivering his first-hand account of his arrest Friday morning. World exclusive! Roger Stone delivers his first statements since being arrested on the Alex Jones Show. Tune in for more breaking news on this vital story! Harrison Smith talked with Jacob Engels, a long time friend and confidant of Roger Stone, about the insanity of Stone’s arrest and indictment. Good Kittens All, this is unimaginably dangerous to every one of us. Like the infamous lynch mobs often featured in Old Western TV plots/shows--where an innocent was either wrongly hanged, or saved from being hanged. Now, instead of raging lynch mobs outside the jail, rope in hand -- we have raging cyber mobs calling for the worst types of violence on Twitter, etc. against students WHO ARE WHOLLY INNOCENT, but were diabolically set up and then demonized by the ENEMY-MSM. This happening/story goes far beyond what was/is being cruelly perpetrated against these youngsters because this cyber violence has been brewing on social media platforms for several years now. It's so horrific that this Big Cat has a difficult time even dealing with such inhumane vitriolic hatred -- like when Peter Fonda called for Barron Trump to be put in a cage with pedophiles. Even if you believe President Trump did what the ENEMY-MSM accused him of, why??? would you attack an innocent child??? Obviously in these current 'endgame' times, the better angels of the human nature is being controlled, destroyed in many of us human beings. And if you believe you can just sit there in some sort of ascended spiritual splendor and ignore all this bad stuff, sorry BUT THAT IS NOT HOW THE UNIVERSE WORKS! You are in the third dimension of reality to ENGAGE, engage the enemy and make the world a better place. Yes, transforming yourself, becoming the BETTER ANGEL of yourself, DOES powerfully impact the world. 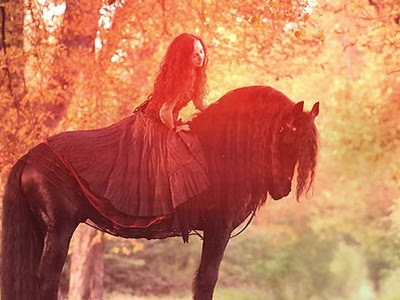 However, without taking good action, there are no good miracles. There is no heavenly world for ALL. So, having been a victim of bureaucratic and media lies, and thus suffered the nasty, life-ruining consequences of these LIES, the Kougar strongly identifies with these kids, who were WRONGLY LIED ABOUT, AND WRONGLY BRUTALIZED BY THE ENEMY-MSM. Why? To cause/foment all the social-cyber violence now being directed at them, at their families. TO DIVIDE AND CONQUER THE HUMAN RACE. QUESTION: WHEN DOES THIS STOP? This lynch mob mentality? 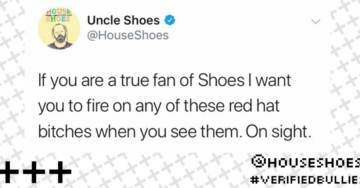 A verified leftist on Twitter responded to the media’s fake news demonization campaign against the Covington Catholic High School students by calling for them to be ‘fired on’ and for their school to be burned down. 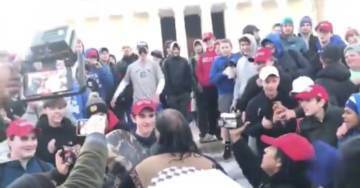 After the teens, some of whom were wearing MAGA hats, became embroiled in a brief confrontation with a Native American activist, the media launched a smear campaign claiming that they had harassed Nathan Phillips. 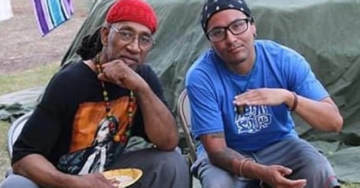 However, full video footage of the incident showed that the teens themselves were being harassed and abused by a militant black identity group and that Phillips had tried to provoke the confrontation by walking into the crowd of boys, who had begun singing high school chants to drown out the homophobic and violent abuse they were receiving. Despite them doing absolutely nothing wrong, the Covington kids were subjected to a sustained 48 hour barrage of violent abuse, threats and doxxing on Twitter, with the Silicon Valley giant doing little to stem the tide of hatred. 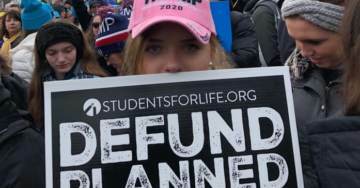 HUGE!… INDIANA MOTHER: My 15-Year-Old Daughter in MAGA Hat Was ALSO HARASSED by Nathan Phillips at March for Life! 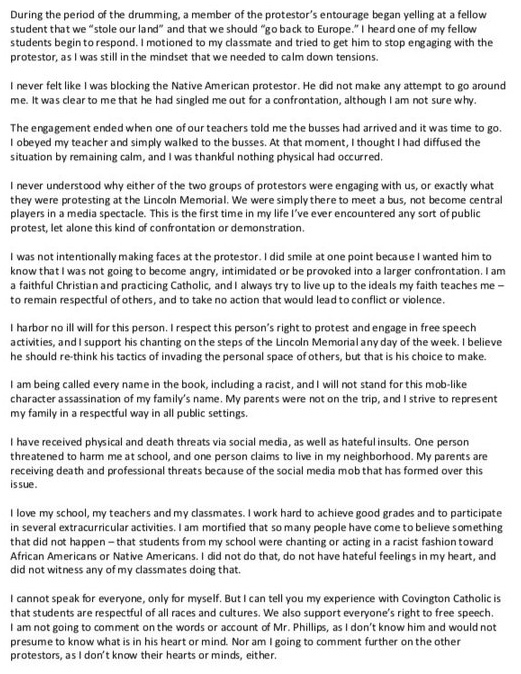 A Native American activist who falsely claimed “harassment” by a group of pro-Trump Catholic school students has a history of feigning outrage to stoke racial tensions. 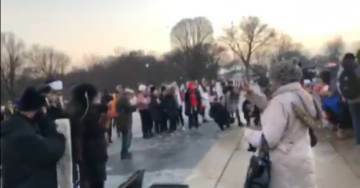 Several video feeds surfaced over the weekend showing activist Nathan Phillips banging a drum in front of a group of students outside the Lincoln Memorial for the pro-life march, which the mainstream media then claimed was an act of racism by the students. 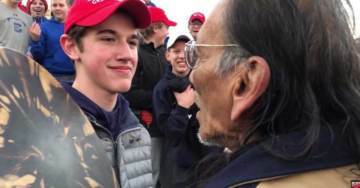 The media demonization campaign resulted in the Covington Catholic school students receiving death threats, prompting several students and their parents to release lengthy statements setting the record straight. 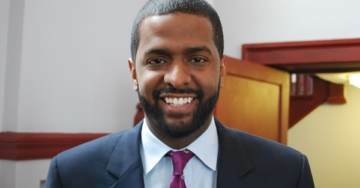 As liberal figures and publications backtrack their accusations in light of additional video showing the full picture, more information is coming to light about Phillips and his history of “drumming up” racial division. In 2015, Phillips accused a group of Eastern Michigan University students of racism after confronting them for wearing Native American garb for a theme party. Additionally, the media is reporting that Phillips served as a Vietnam veteran, but the validity of those reports remain in question given Phillip’s claim that he was a “Recon Ranger” is a nonexistent operational force. 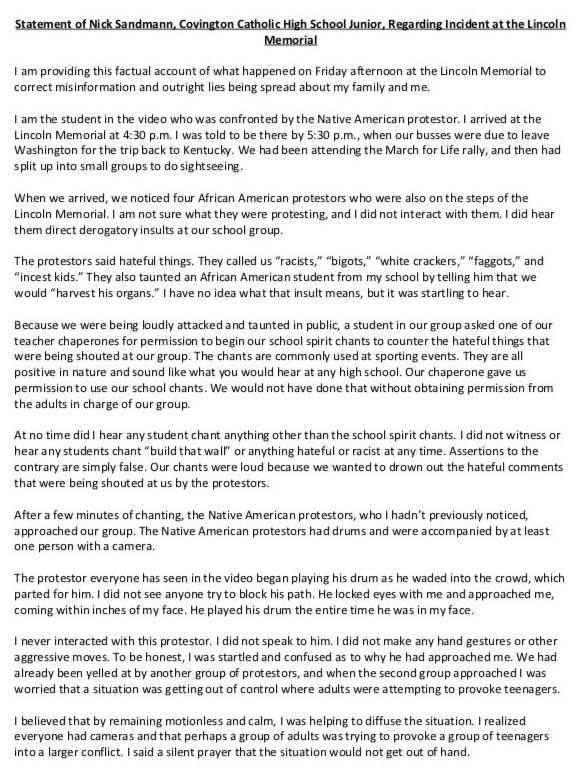 BREAKING: Native American Activist Nathan Phillips Is a Poseur and Likely a Phony Vietnam War Veteran! The brother of a random young teen named Michael Hodge, who was wrongly identified as a student of Covington Catholic High School and doxed by hate-filled Twitter mobs, revealed Sunday how the Twitterati is working tirelessly to destroy the lives of his entire family. On his personal Twitter account, Michael’s brother Andrew Hodge told the disturbing story of how a day which was supposed to be a celebration of their brother Alex getting married turned into a nightmare.